CHESTNUT HILL, Mass. 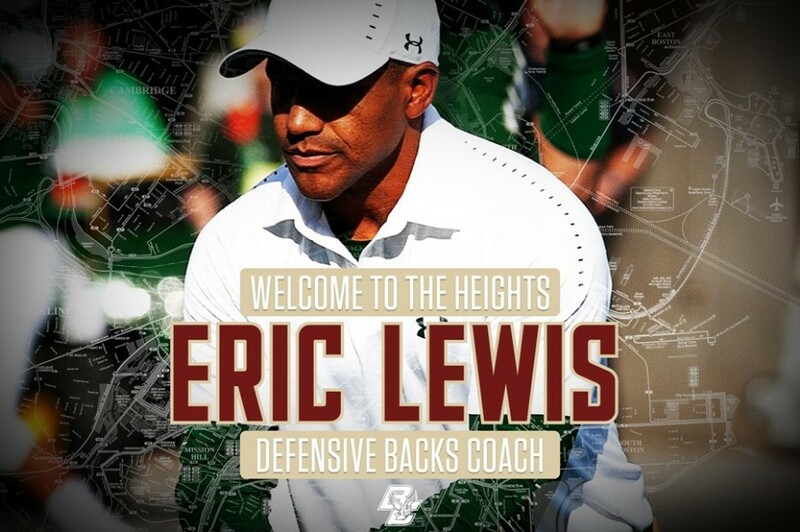 – Boston College head football coach Steve Addazio has announced the hiring of Eric Lewis as the Eagles’ defensive backs coach. A native of East Lansing, Mich., Lewis has more than a decade of collegiate and NFL coaching experience. Prior to Boston College, Lewis spent one season at Colorado State coaching the cornerbacks. Before heading to Colorado State, Lewis was on the defensive staff at the University of Tennessee in 2017. Prior to his time in Knoxville, Lewis served as secondary coach and special teams coordinator at Georgia State (2015-16). Lewis oversaw a secondary where the defense set a program record for interceptions (15) and pass breakups (57) in his first year as coach. Lewis was part of a defensive staff that coached the most improved defense in FBS in 2015, as Georgia State led the nation by allowing 15 points fewer per game than in 2014. Lewis spent one season as the secondary coach at Buffalo (2014) and served as defensive coordinator at Weber State (2012-13) and Eastern Michigan (2009). In his only season as defensive coordinator at Eastern Michigan, EMU allowed just 150.1 passing yards per game, the fewest yards allowed per game nationally. Lewis has one previous year of coaching experience in the ACC as coached the cornerbacks at Louisville in 2008. Before joining the Louisville staff, Lewis spent two seasons as a defensive quality control coach for the Green Bay Packers. He coached the safeties at Ball State from 2003-05 and served as a defensive graduate assistant coach at both Michigan State and Bucknell. Lewis was a four-year starter at San Diego State as he finished his career as the Aztecs’ all-time leader in career pass breakups. He graduated with a degree in finance and business administration. Lewis is the son of long-time college and NFL coach Sherman Lewis. He married his wife, Elizabeth, in July of 2018. He has two children, Taylor and Harper. TRANSACTIONS: Boston College names Eric Lewis defensive backs coach.